Pit Crew Panic! is a frantic, action-packed game that unfolds on the racing circuit. During the game, the pit crew is not only faced with repairing vehicles, but various WHATSITs as well! Handling the WHATSIT repairs is a pit crew made up of legendary beauties! Simple controls! Just grab a member of the crew with the Wii Remote controller's A Button, release the button when the Pointer is over the damaged PART, and that crew member will begin repairs. 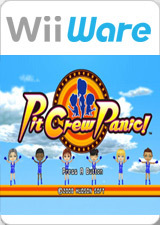 Assign repairs to the members of your team, and provide support using the Wii Remote controller to send a fully repaired WHATSIT out of the pit as quick as you can! The game features Normal mode, which can be played using one of two rules: Abnormal mode, where players split into two teams and compete against each other; and Ranking mode, where you compete with players around the world for the top record. Each mode can be played with a maximum of four Wii Remote controllers, allowing you to team up with friends and family. In short, your teamwork could lead to outstanding records! The graph below charts the compatibility with Pit Crew Panic! since Dolphin's 2.0 release, listing revisions only where a compatibility change occurred. This page was last edited on 22 January 2018, at 04:40.